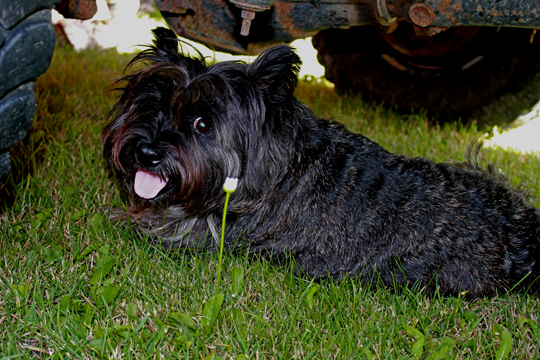 One of Elizabeth’s local blogging friends wrote this about one of our furry neighbours. Foxes are big teases, and they hang out on the Campbell Estate. All Elizabeth ever sees with me around, though, is their footprints in the snow! On the way home from a fishing trip the other day (one splake), Lil and I spied a cross fox in a field beside the road. The fox was quite cooperative, and let me stop the truck, get my camera out of the bag and take several shots. It looked like it was intent on a mouse, or more likely, a vole, but no luck (although good luck for the vole). Eventually, the fox wandered off. A cross fox is simply a colour phase of the red fox. Across the range of the red fox different colour phases are often seen, but in this area, the common and classic bright orange red fox is actually quite rare. Most of the foxes here are crosses. They are called cross foxes because they have a blackish cross on their back, across their shoulders. I guess all of you my faithful readers have been wondering if I was abducted by aliens, eh? Well… No. But I had a close encounter yesterday! Could they be Crop Circles? As a Bookshop Dog, I have developed a very open and scientific mind. I’ve heard about this phenomenon two-leggers call ‘Crop Circles’. The theory is that these things are made by alien spacecraft when they land or take off. Elizabeth knows a lady who says she knows the people who made the original Crop Circles in Britain, though, and that the whole alien thing is a hoax. I decided to see who was right. I took a closer look at one. As a dog, I have an advantage over two-leggers. I have a sensitive and highly developed olfactory system. I have a nose for detection. And I detected a new-to-me but definitely animal scent trail. Well. I guess that technically, Aliens are probably animals too. Only one thing to do… follow my nose to the source. Yikes! It looks like a Stegosaurus tail! I checked it out from another angle. 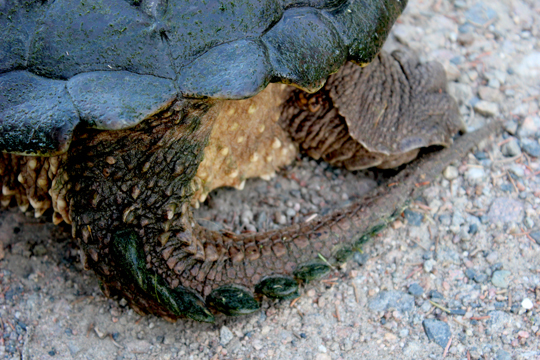 the rear end of a Snapping Turtle (Chelydra serpentina)! 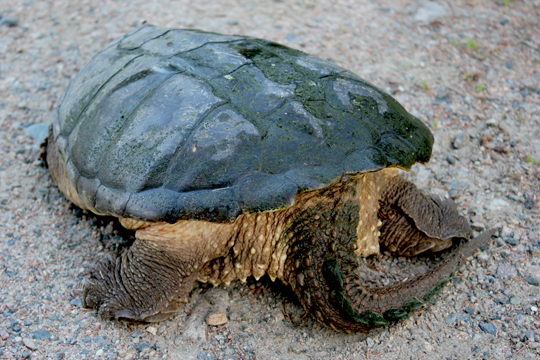 The Snapping Turtle is the largest of Ontario turtles and can live up to 70 two-legger years or more. I can’t imagine living that long! They are not endangered, but they are on the watch list. They have a low reproductive rate and take a long time to mature. And two-leggers, well, some of them, like to hunt and eat them. Or just to kill them because they think they are mean old ugly things. Once Elizabeth was invited to have some by one of the lake people she knew. She almost tried some, but when the old man mentioned that he kept them in his freezer and that they took an awfully long time to die, she just couldn’t accept any. She doesn’t really like these turtles, but they fascinate her. This one fascinated me, too. I felt I had to examine it from all angles. Although she looks shy in Elizabeth’s photographs, she wasn’t really. This is a very aggressive stance, as I found out. See how her rear end is slightly elevated? 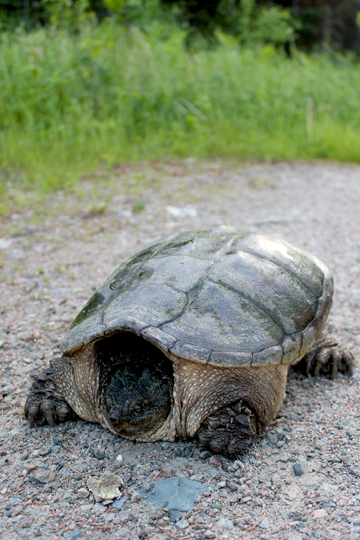 This female had made the trek up from our bay to find a place to lay her eggs. She needed to get the job done, and I guess she thought I was trying to interfere. Suddenly, she reared up on her hind legs and tail, and her head shot forward at me! She tried to snap my nose off! Fortunately, I didn’t know her, so I was being a bit cagey myself. I managed to avoid her lunge. I thought it was very rude of her, and I began to move in to teach her a lesson. One does not snap at the Queen of the Boreal Forest without suffering the consequences! Elizabeth grabbed my collar and took me for a little walk. I’m still ticked off with her. She shouldn’t interfere with me when I’m on the job. 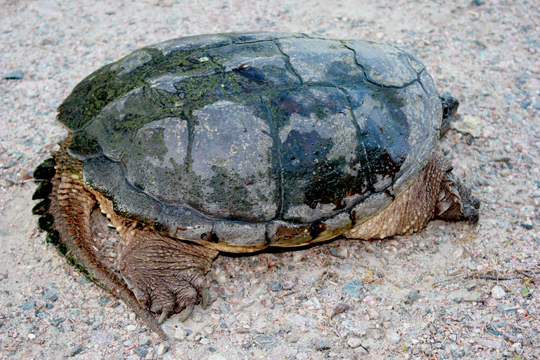 This was obviously a very dangerous turtle. It needed first to be taught a lesson and, second, to be banished to its watery domain. When we got back from our walk, she was just about the same place. Elizabeth didn’t notice until she was looking at the photos today that it appears to be blood on the right side of her carapace. While I don’t condone her behaviour, neither do I wish her any harm. 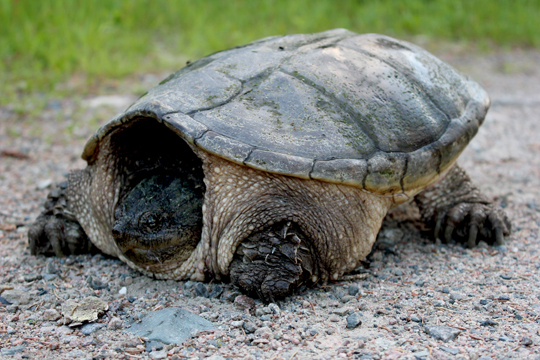 I hope she makes it through laying her eggs and back through the forest, down the hill and into the river again. Elizabeth put me in the house and then went out to talk to the turtle and get some more pictures of her. 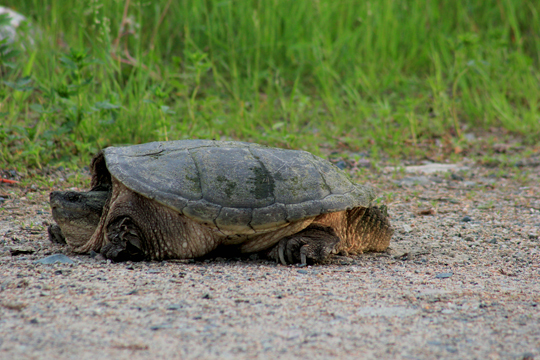 By the time we had to leave for Church, the turtle seemed much more relaxed. This is the only one Elizabeth took with her telephoto lens. 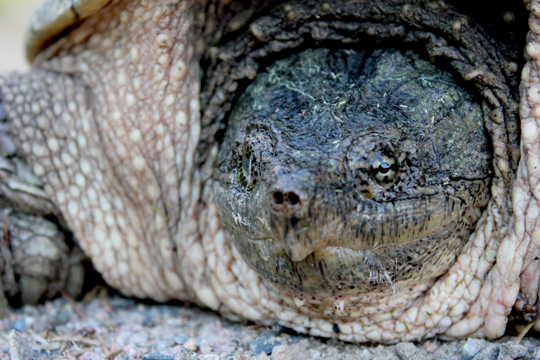 The turtle didn’t snap at her when she got her camera in close for the facial portraits! Hmmph. 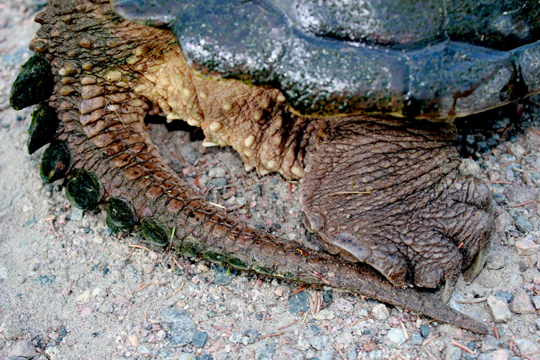 When we got home, the Snapping Turtle had continued her uphill quest in search of sandy soil deep enough for her to make a nest for her eggs and cover them in such a way that no one would ever guess they were there. 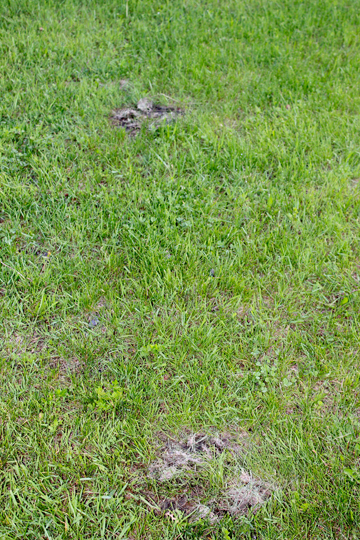 Maybe I will meet some of the baby turtles after they hatch and begin their journey down the hill to the bay…. It’s been a busy week here on the Campbell Estate. With Winter just around the corner, the two-leggers have been thinking about getting prepared for colder weather. Jeff the Tree Man was here a few weeks ago, if you remember, and he left several piles of wood for winter burning. But it wasn’t enough to keep the two-legger house warm all winter. So, something had to be done! Our old supply lines have dried up. Jeff the Tree Man knows a lady who is in the firewood business. He gave Kay the lady’s number and she said she could sell us some wood. She came with her truck, her helper/husband, the firewood, and a surprise! 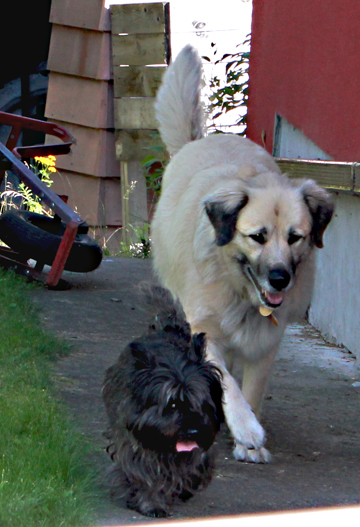 We had a great time for a while, then Maddie got a bit grouchy and decided to go off on her own. I got worried when she started heading for the river. 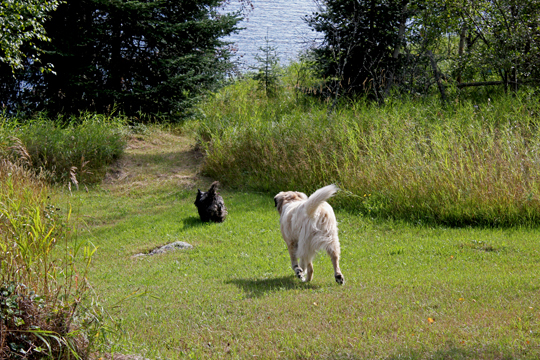 Although Maddie sort of looks like a miniature Newfoundland Dog, I hadn’t asked her if she could swim. The river is still very high, and she’s so small! I decided I’d better at least keep an eye on her, since I didn’t really seem to be able to keep up with her. Well, I could’ve if I had to… I think…. See. I told you so. I headed her off at the pass and steered her back up the hill to where the two-leggers were working and chatting. That run seemed to tucker little Maddie out though. She decided it was time to have a rest. I don’t know what I said to her. 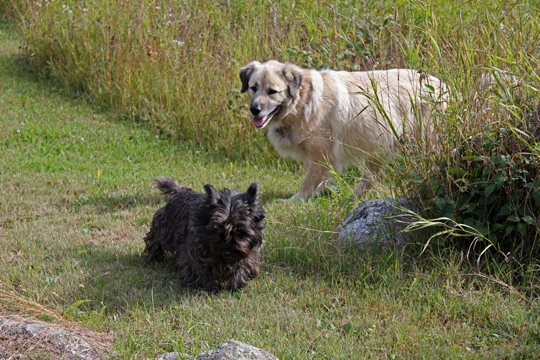 It would have been fun to spend more time with another dog, but she was really quite aloof. There was no way I could settle down with her here for a chat. Lori the Firewood Lady’s assistant was very kind. He stored all of the dry wood in our woodshed for us while the women talked. Then they left. They took Maddie with them. 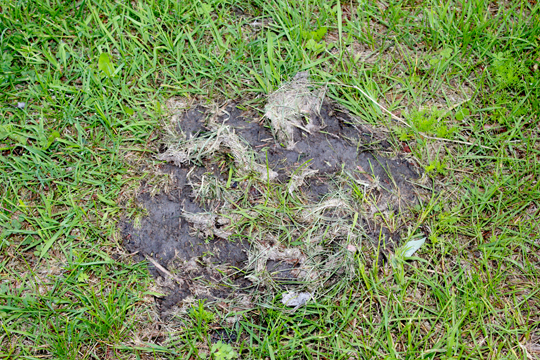 A few days later, a bear walked through the yard just before Elizabeth came to let me out of my kennel for my a.m. b.m. and run. I was so focused on my mission that I missed another less conspicuous but far more unusual visitor. Fortunately, Elizabeth had her camera handy. She took pictures so I could see. I asked her if she’d show you, too. 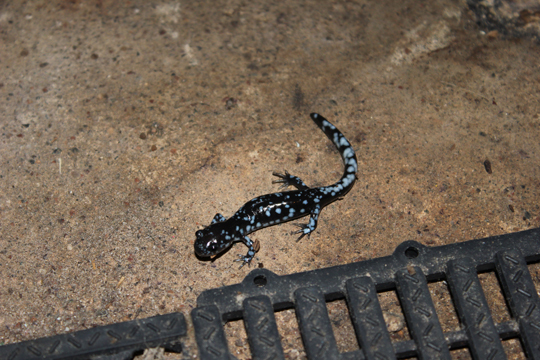 This Blue-spotted Salamander (Ambystoma laterale) was just heading home after a busy night’s hunting. He’s only about 6 cm (just over two inches) long. Although Elizabeth has seen him several times now, I haven’t met him (or her, we’re not actually sure…). I’d sort of like to meet this fellow. 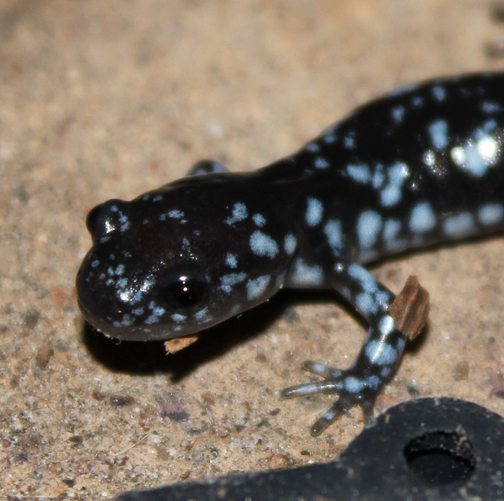 Apparently, if this little amphibian feels threatened, he will raise his tail up and emit a foul-smelling scent. That’s not so unusual. Skunks do that all the time! 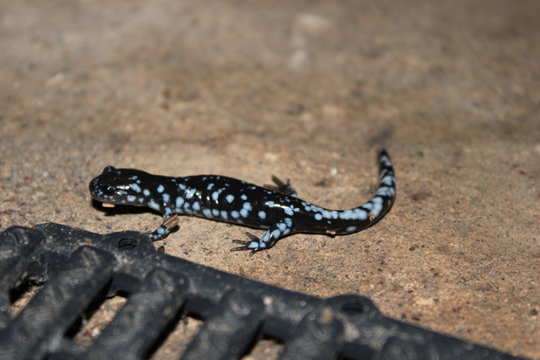 What is really strange is that Blue-spotted Salamanders will let their tail fall off, too! I guess if they are in a hurry, they don’t want to carry all that extra weight around… BOL!